The Orthoptera is a large and diverse order of mostly medium sized to large insects; some are among the largest living insects, with bodies about 12 cm long and wingspans almost twice as great. They have biting and chewing mouthparts; enlarged hindlegs modified for jumping; a large, saddle-like, pronotum, often expanded posteriorly; and a general ability, especially in males, to make loud noises by stridulating. The order is famous for these ‘songs” which are used for intraspecific communication (mate acquisition and territorial songs, alarm calls); they are often the most important characters for separating closely related species. Sounds are received by a hearing organ, or tympanum. Although most species are not particularly strong fliers, wings are usually functional; often they are reduced or absent. When fully developed, the forewings (not used for flying) are usually leathery and narrower than the broad, fan-like, membranous hindwings. Development is gradual and the nymphs resemble the adults; there are generally four to six nymphal instars. Most feed on plants, but many are omnivorous and some are carnivorous. The order is divided into two suborders. The Ensifera and the Caelifera. 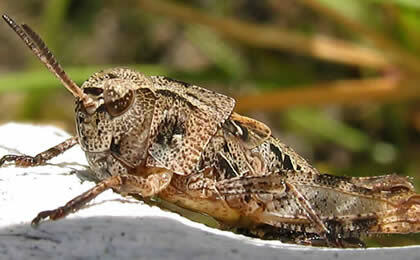 The Ensifera includes the katydids, crickets and other related groups; it is sometimes placed in its own order, the Grylloptera. The Ensifera have thread-like antennae usually at least as long as the body (they are sometimes called the long-horned grasshoppers for this reason); tarsi with three or four segments; front tibia often with an ear near the base (and no tympanum on the side of the first abdominal segment); forewings (tegmina; singular, tegmen) with at least the basal venation normally modified for stridulation, sound usually produced by a file-like ridge on one wing rubbing against the edge of the other; ovipositor typically long and sword-shaped or needle-shaped. Most species of Ensifera are nocturnal, and most of the insect noises in the night are their productions. They do not range as far into the temperate regions of the Northern Hemisphere as the Caelifera and, unlike the grasshoppers, primarily live in shrubs and trees; many are mimics of plant foliage. A significant number of species are cave dwellers or soil burrowers. Many species are omnivorous and some are exclusively carnivorous. Some species live in termite and ant nests. Eggs are laid individually or in small groups, but not in pods, as in the Caelifera; the female normally inserts them in plant tissue or soil with its ovipositor. There are over 20,000 species in the world, most of them in the tropics and subtropics. In B.C., 12 families containing 117 species are recorded. British Columbia has 40 species of Ensifera in nine families; one of the species is an alien introduction and five are adventive (recorded, but not established) species. 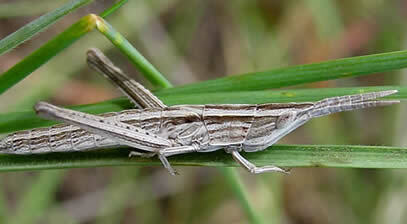 The second suborder, the Caelifera, consists of the true grasshoppers and locusts; it is sometimes classified alone in the Orthoptera. 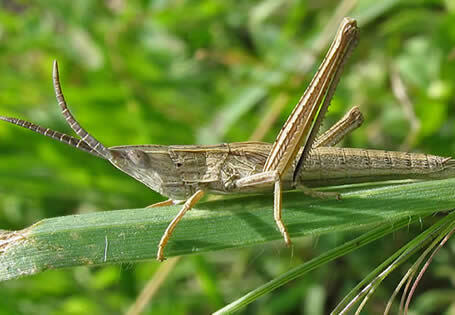 Compared to those of the Ensifera, the antennae of the Caelifera are thicker and shorter, seldom as long as the body (thus an alternate name for them - “short-horned grasshoppers”). The ovipositor consists of short valves for digging in soil. The tarsi usually have three segments, sometimes fewer. The fore tibia never has a hearing organ (there is a tympanum on each side of the first abdominal segment). If sound is produced, it is usually made by striking the tegmen (sometimes the abdomen) with a ridge on the inside of the hind femur. Some Acrididae “crepitate”, making a crackling noise by snapping their hindwings in flight. Species of Caelifera are mainly diurnal and are particularly active in warm weather and sunshine. They are better represented in temperate climates and range much farther north than members of the Ensifera. Although in temperate regions, grasshoppers live mainly on the ground or in low vegetation, in the tropics and subtropics there are many shrub and tree-dwelling species. None lives in caves, although some burrow shallowly in the soil. A few are partially aquatic and may have their hind tibiae and tarsi broadened for swimming. Most feed on plant material of various sorts, although animal matter is sometimes eaten. Females normally lay eggs in the ground in batches (pods) held together by a foamy secretion. There are 77 species of Caelifera recorded in B.C., but two of these do not have established populations. Only two families are represented, and 74 of the 77 species belong to the family Acrididae; the other three are in the Tetrigidae. Scudder, G.G.E. and D.K.McE. Kevan. 1984. A check-list of the Orthopteroid insects recorded from British Columbia. Journal of the Entomological Society of British Columbia 81: 76-79. Vickery, V.R. and B. Nagy. 1973. Ecological notes on Orthoptera (s.str.) in British Columbia. Journal of the Entomological Society of British Columbia 70: 27-33. Vickery. V.R. and D.K.McE. Kevan. 1985. The Insects and Arachnids of Canada. Part 14. The Grasshoppers, Crickets, and related Insects of Canada and Adjacent Regions. Agriculture Canada Research Branch Publication 1777. Ottawa. 918 pp. This write up is extracted from the forthcoming publication by Scudder and Cannings: the Insect Families of British Columbia. Illustrations by L. L. Lucas. Copyright © 2005 - All rights reserved.